Product code: T896 Categories: Antique, Antique Engagement Rings, Antique Rings. Here is a very attractive antique sapphire and diamond ring that was made in 1918, and looks as good today as when it was made 100 years ago. Sitting perfectly on any finger, the ring was made in 18ct yellow gold and set with three lovely natural sapphires that total 0.12 carats and two diamonds that total 0.02 carats and add the right amount of sparkle to capture the light. 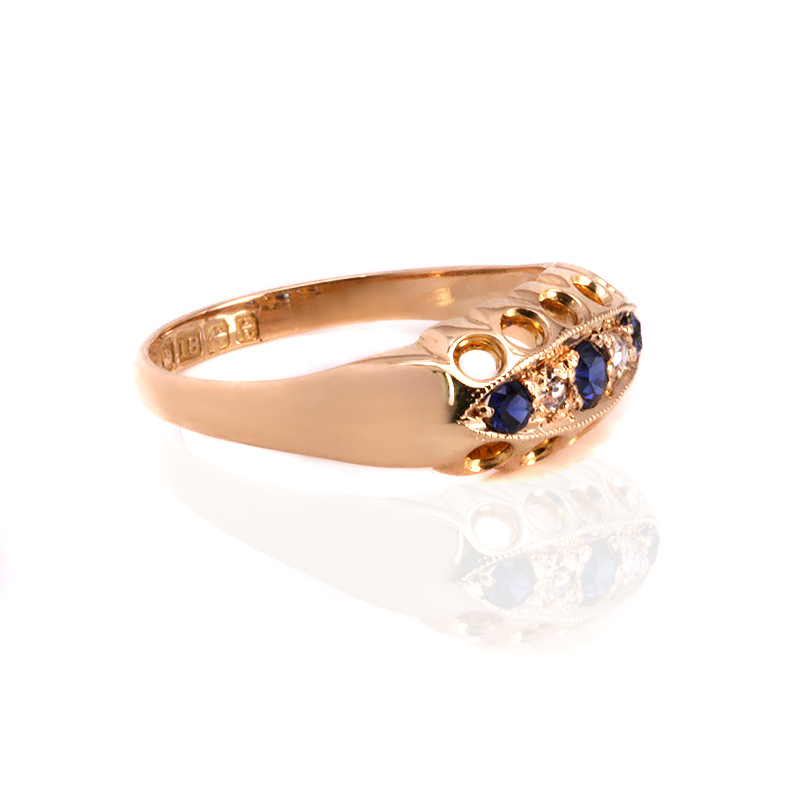 This lovely traditional ring will suit any woman of any age including making a wonderful 18th or 21st birthday present to show how in vogue antique rings are, as well how you don’t need to break the bank in order to have an 18ct gold ring, set with sapphires and diamonds, as well as being 100 years old. Measuring 6.9mm wide at the centre by 13.6mm across, this is the perfect size to put on and wear all the time and let it get the admiration that it truly deserves. Tags: Antique sapphire and diamond ring, Antique sapphire and diamond ring made in 1918. This antique sapphire and diamond ring would make a perfect 18th or 21st birthday present. Set with natural sapphires and diamonds, it is a wonderful example of a style of antique ring that is as popular today as when it was made. Antique sapphire and diamond rings such as this also make wonderful engagement rings.